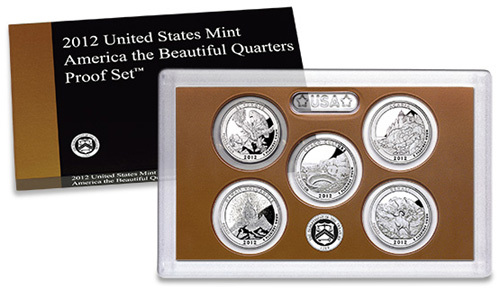 On January 17, 2012, the United States Mint began accepting orders for the 2012 America the Beautiful Quarters Proof Set. Each set includes the five new quarters scheduled for release this year in proof format. United States Mint proof coins are struck multiple times with specially polished dies. The proof blanks are also specially treated, polished, and cleaned to ensure high quality strikes. The resulting coins feature sharp relief, with frosted sculpted foregrounds and mirrored backgrounds. The proof coins included in this set are struck at the San Francisco Mint and carry the “S” mint mark. The 2012 America the Beautiful Quarters Proof Set is priced at $14.95, unchanged from the price level for the prior year set. There are no household ordering limits or specified maximum production limits imposed. Since 1999, the United States Mint has offered separate proof sets containing only the year’s quarters, in addition to the annual sets containing all of the year’s circulating coin denominations. The full 2012 Proof Set will be released at a later date.